It was once by far the most popular social network and one of the top 10 online destinations overall. 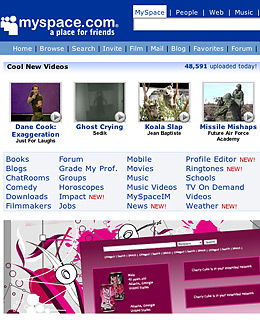 And, yes, TIME.com named MySpace one of its 50 Coolest Websites of 2006. But since then, things have taken an ugly turn, and we're not just talking about poor page design. It seems the community has become infested with marketers and other opportunists who create false profiles and essentially spam other users, all under the guise of "making friends." Of course, there have always been loads of MySpace profiles of fictional characters, created to help market a movie or promote some other brand. But it's the bait-and-switch tactics from these leeches (Want to be my friend? Buy a ringtone! Fill out this survey!) that have taken things to a whole new  and sad  level.